. : Racing with Earl - The XC Ski Team at Earl of March Secondary School :: Ski XCOttawa.ca :: Skiing in Ottawa and Gatineau Park :. In elementary school you heard of teams for sports such as volleyball and basketball. Frankly I was too uncoordinated for either of them and my footwork lacked for soccer, but where my talents did lie was with cross country skiing. Twice a year, I could shine at Mr. Dumouchel's awesome WEJ ski days at Fitzroy, but other than that my athletic skiing abilities went relatively unnoticed. When I arrived at Earl of March Secondary School, all of that changed. I was surprised that among Earl's wide variety of teams, nordic skiing was included and was even more amazed that we had enough skiers for a team as all the teen skiers I knew from Kanata Nordic were spread thin throughout the various Kanata high schools. As it turns out, there were many eager skiers within Earl that I was unaware of, including fellow Kanata skiers Jonathan MacAskill and Jonathan Roscoe as well as some Nakkertokkers, novices and two guys who had ski experience from doing biathlon with Air Cadets. Through joining the Earl team I have met several nice kids who share the same passion for the sport and it has been a great way to meet members of other clubs with no logo or emblem between us. The Earl team begins training at the start of December and if there's no snow, we do dry land activities such as running and also use the indoor spinning bikes which are plentiful at Earl. When the snow arrives, we train at the Earl fields as well as the Y camp. The high school races take place in February. There are usually two practices a week and the team welcomes all abilities. A great thing about the Earl Nordic Ski team is its opportunities for novice skiers who are just picking up the sport. One thing I should mention, the technique for high school racing is skating. Luckily, to get the essential skills, Earl has the experienced coaches Ari Neimi and Keith Dustin for guidance. Although I still have more to learn, I enjoy helping novices with some pointers. I'm really impressed with how initially some new skiers were participating as a fun venture with no plans to race, but as it turns out, with new ski skills and determination, they are equally excited about upcoming races. Fellow students and my peers' attitudes towards skiing have shifted after observing the team in action looping the Earl track. My non-ski friends now realize that it's not always mild-mannered classic skiing through a quaint trail in the Gatineaus. Even new Earl team member and friend Derek Smith, a long-time hockey player who just started skiing this year to cross-train for triathlon (ironically that's the same reason my dad Dev started) admitted to the fact that skiing took more out of him than he anticipated, recognizing it was an actual hard-core workout (as many have seen in Track Attack). Skiing is a very distinct sport; once while changing for practice, another student athlete walked in on a few of us and upon seeing our spandex he commented instantly "I'm guessing this isn't basketball tryouts." It's comical that when sharing the change room with the basketball team, I am thinking "wow these guys are really intense", but that in turn is exactly what they think of us! 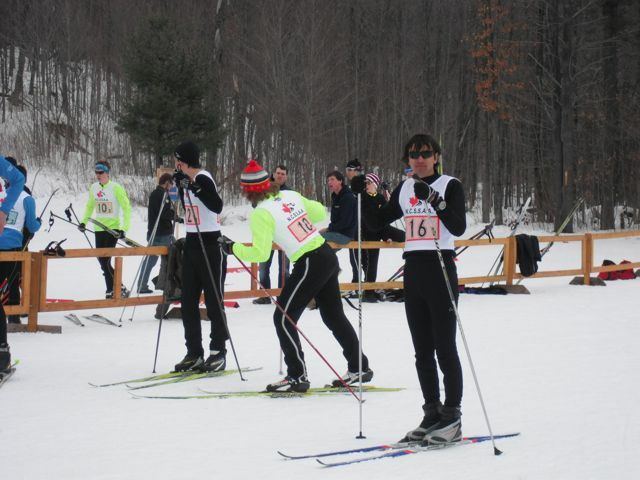 The NCSSA high school championship was on February 8th and 15th at the Nakkertok facility. For junior boys (grades 9 and 10), the race is 5km and for junior girls, 3km. My Earl teammate Keira Neimi from Nakkertok is an exceptionally talented and competitive skier who often wishes her distances were longer. For a skier of her calibre, it is little more than a sprint. The actual 5km course I've experienced at the 2011 NSCAA features laps through Nakkertok's trails with the first more moderate than the second. The first has several mild inclines with an equal amount of small drops so amassing momentum and carrying through the up-down course is critical. Through the sport, not only do I meet skiers at my own school, but also from others as well. A few weeks ago I was training with the Earl team at the Y and low and behold, the Track Attack legend Syzmek Wasiak arrives on the scene with the All Saints High School team. Syzmek skied with the club when he was younger, so it was nice to cross paths again. He tends to inspire me to push harder by running me to the ground with his blitz-speed technique. As well, the high school championship is another fantastic opportunity to meet teams and skiers, for example fellow Track Attacker Stephen Xu and Kanata Racer Robert Lee who both compete for Bell High School. Bell High School team with their race faces on. Racing with the Earl team has been a wonderful experience, one I'm excited to share with Track Attackers who are coming to Earl of March next year including Aidan Kirkham, Jeffrey Vigneron and Zach Leung. There's nothing wrong with a little friendly competition: Noah Graham, another proud Attacker, will also be joining his Franco-Ouest Team in the Junior division next year. I hope to see you all at the NCSSA in 2013! XC Local: Spring Skiing at Nakkertok South: Still good "up top"
XC Local: Interest in a University of Ottawa Cross Country Ski Team?